PurrFit Fashions got its name from my husband John, who thinks everything that comes off my sewing table is simply “purr-fit”. I also have some pretty contented customers, so I guess “PurrFit Fashions” sums it up nicely. Alania Sheeley in her sewing room. Getting a good fit is important. I want my customers to look their best; both in custom clothing, as well as purchased garments. If your clothes fit your body, you appear slimmer, are more comfortable, and look your absolute best. 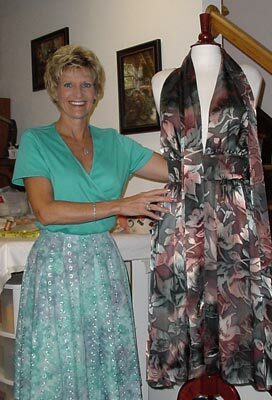 I am an accomplished seamstress, and can work with you to get the wardrobe of your dreams. Follow me on Facebook for the latest fashion news, tips, projects, etc. Here is the link: https://www.facebook.com/pages/Purrfit-Fashions/356036014413574.